Food is at the heart of Vietnamese culture, and Vietnamese food is one of the most popular cuisines in the world! Mixing together a range of taste and flavors, Vietnamese food represents a perfect combination of sweet, savory, sour, and hot flavors, accomplished by combining a profusion of fresh herbs and spices and flavorful sauces. 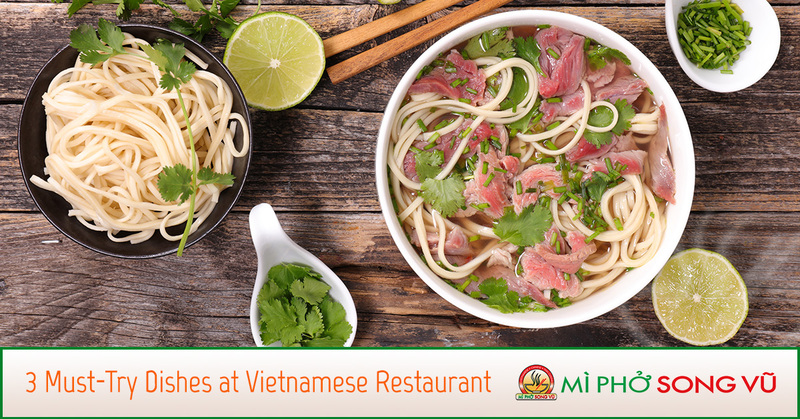 At Mì Phở Song Vũ, we serve up fresh and authentic Vietnamese cuisine each and every day. While there are many people who enjoy eating Vietnamese dishes, there are some that are new to this type of cuisine. If you haven’t tried Vietnamese food yet, you are missing out! Whether you have never tried Vietnamese food before or are looking for a new and authentic dish to try, in this blog we are going to cover some of the must-try cuisines that we serve at our Vietnamese restaurant in Hamilton and Toronto, ON. Perhaps the most popular Vietnamese food, Pho is a simple dish that consists of rice noodles in an aromatic, light, and clear broth made from boiling meat and spices. Typically Pho is made with chicken (Pho Ga) or beef (Pho Bo) and typically comes topped with bean sprouts, basil, mint, spring onion, cilantro, fresh lime, and sliced red chiles. At Mì Phở Song Vũ, we serve over 20 different Pho dishes. Plus, we are one of the only Vietnamese restaurants in the area that offer Pho delivery! Spring rolls have a special place in Vietnamese cuisine and they appear in many varieties and form a separate category of Vietnamese foods. Cha Giò is a spring roll that is fried to a crunchy and delicious perfection. The crispy shell with a soft vegetable and meat filling, dunked in a tangy sauce makes Cha Giò the perfect snack or appetizer before a meal. Typically these rolls are filled with meats like pork, crab, shrimp, or chicken, and greens, herbs, and rice vermicelli. Mì Phở Song Vũ we have a variety of Cha Giò dishes. You can get fried spring rolls made with shrimp, grilled beef, pork, or chicken. Never short of flavor or crunch, these rolls are the perfect tasty snack. Although Cơm Tam is a simpler rice dish, it is often one of the most popular types of Vietnamese food. Many people who try Cơm Tam are surprised that the dish uses much smaller grains of rice than what we are used to seeing. The reason why the grains are so small is that this dish uses broken rice, or grains that have been half-ground during the milling process and discarded. Cơm Tam typically is served with grilled pork and topped with a mixture of vegetables. If you want to try Cơm Tam in Ontario, head to Mì Phở Song Vũ where we have a wide selection of Cơm Tam dishes. Of course, there are a seemingly-endless amount of Vietnamese dishes, but the three above are some of the most popular and must-try foods. Finding authentic Vietnamese food can be difficult, but not at Mì Phở Song Vũ. We freshly prepare each dish while using fresh and authentic ingredients. Craving Vietnamese delivery food? Order food delivery in Hamilton and Toronto from our restaurant.